Praise for this book: This book is an invaluable educational resource for rhinologists not only in training but those well established in practice too. It is one of the few books that I found so well written that I could pick it up and read it with enthusiasm from cover to cover. It is excellent value for money as well as one of the most comprehensive and easy to read sinus surgery texts available. - - ENT & Audiology News This updated and expanded third edition of Endoscopic Sinus Surgery provides detailed, step-by-step instructions on how to perform state-of-the-art surgical techniques on the paranasal sinuses and skull base. It extensively describes the anatomy of all regions within the sinuses and adjacent intracranial cavities and includes unique, practical guidance on using CT scans to reconstruct 3D images of surgical anatomy. Access to more than 40 videos, available on Thieme's MediaCenter and illustrating the anatomy and surgical steps for all procedures, is provided via a scratch-off page in the book. 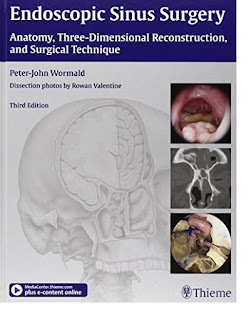 Features of the third edition: Three entirely new chapters on anatomy of the sphenoid, surgery of the craniocervical junction, and management of carotid artery and other major vessel injuryMore than 150 new high-quality dissection photos help clarify complex techniques throughout the bookOnline access to more than 40 operative videos demonstrating surgical techniques This operative manual is an essential reference for otolaryngologists and skull base surgeons who need a refresher on a surgical procedure as well as residents and fellows seeking guidance on the latest endoscopic techniques for the sinuses and skull base.